Wild animals roaming the Kenyan plains include wildebeest, elephants, zebra, lions, leopards, cheetah, giraffe, impala and gazelles, but that's just for starters. The abundant animal life in the Olare Motorogi Conservancy is quite simply jaw-dropping, and you won’t need to go far to see some unforgettable sights. All the drama that only nature can provide is on your doorstop and you’ll be in the hands of our experienced Field Guides with a front row seat on your safari tour. 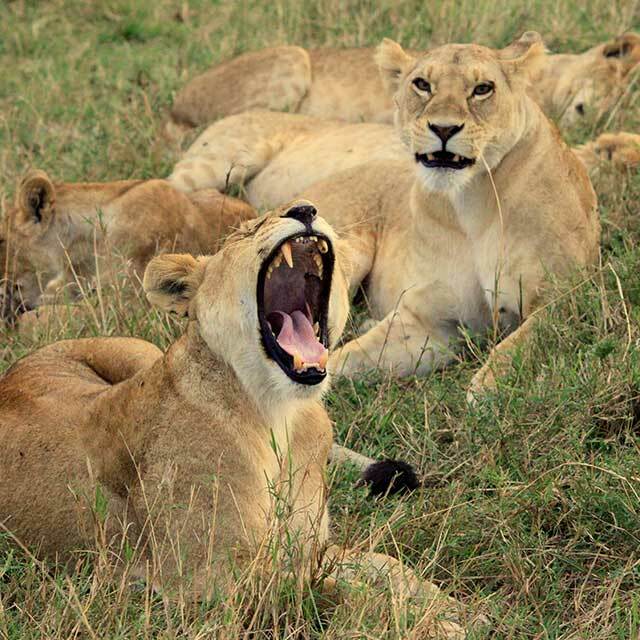 A number of lion pride territories meet in the Olare Motorogi Conservancy which can make for some interesting encounters as the different groups battle for dominance. The area is also home to roughly 150,000 Loita wildebeest that don’t make the annual migration south and seem content to 'loiter' all year round! Of course one of the biggest draws to the area is the annual 'Great Migration', which sees up to one million wildebeest plus hundreds of thousands of zebra, gazelles and other game undertake a journey of roughly 1,600km through Tanzania and Kenya. Known as one of the seven 'new' wonders of the world, the annual Great Migration, or Great Wildebeest Migration to be more accurate, is truly breath-taking. The migration is in fact a sort of circle, with anywhere up to 2 million animals, mostly wildebeest, moving en masse in a never-ending search for food and water. The wildebeest and accompanying zebra, gazelle, eland and topi make up the bulk of the migration, but they aren't the only players. Lions, hyenas, leopards and other predators take full advantage of the passing buffet and exploit every opportunity in search of a decent meal! Some of the highlights are being immersed in the mass of wildlife - a truly intimate experience amidst this astonishing natural spectacle. This is a key time for wildebeests to breed, and incredibly, a newly born wildebeest will be on its feet and walking around within 3 minutes, running with the herd within 5 minutes, and able to outrun a predator shortly thereafter! The best time to view the migration will depend on the climatic conditions that year, but in the Olare Motorogi Conservancy you can expect to see the herds arrive anytime from July to September, departing around November for the return journey to the Serengeti in Tanzania. 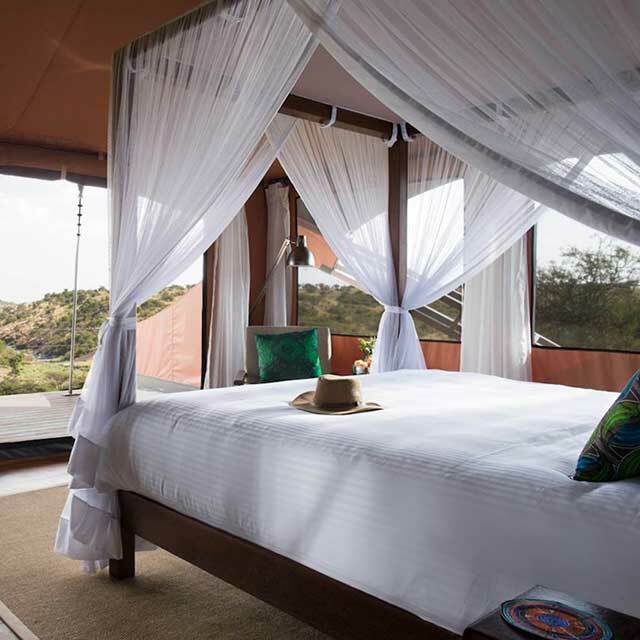 During migration high season our rates also include one complimentary day pass per adult to the Maasai Mara National Reserve when you book for at least 3 nights. 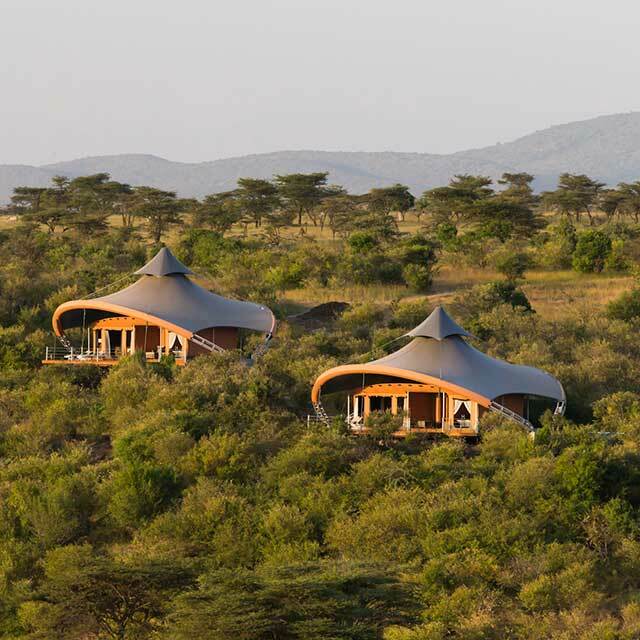 We are located in the Olare Motorogi Conservancy, and are a part of one of four established conservancies which together cover a total area of 63,000 hectares in the Greater Maasai Mara ecosystem, bordering the northern edge of the Maasai Mara National Reserve. The other three conservancies are Olare Orok, Mara North and Naboisho, and together all are helping to increase the protected area of the ecosystem by nearly 50%. Since 2006 a unique land management structure has been developed in the conservancies with a dual aim of extending the protection afforded to wildlife in the National Reserve to an even greater area whilst directly supporting the needs of some 1,550 Maasai families. Today we are seeing both the Maasai community and safari guests enjoying the true benefits of conservation of this land in a relationship that will see the ecosystem protected for many years to come. During our twice daily game drives, you will be in the capable hands of our experienced Guides. As no two drives are ever the same, you will have a front row seat to some unforgettable sights across the Kenyan Plains. As the only female guide at Mahali Mzuri, Betty is not only a great role model to her family but to the wider community at large, proving, in her words, that “what a man can do, a woman can do better!” Having originally served in the military, Betty has worked as a guide since 2005 so has a wealth of experience in tracking animals of all shapes and sizes. However, in her opinion, nothing beats seeing a pack of lions hunting and bringing down an adult buffalo! John was a local teacher before training to be a guide over 13 years ago and hasn't looked back since! Some of his most exciting moments on camp have been on safari with guests and having close encounters with buffalo, elephants and even lions! However, there have been some equally exciting moments trying to track very specific creatures such as the elusive pangolin and honey badger. 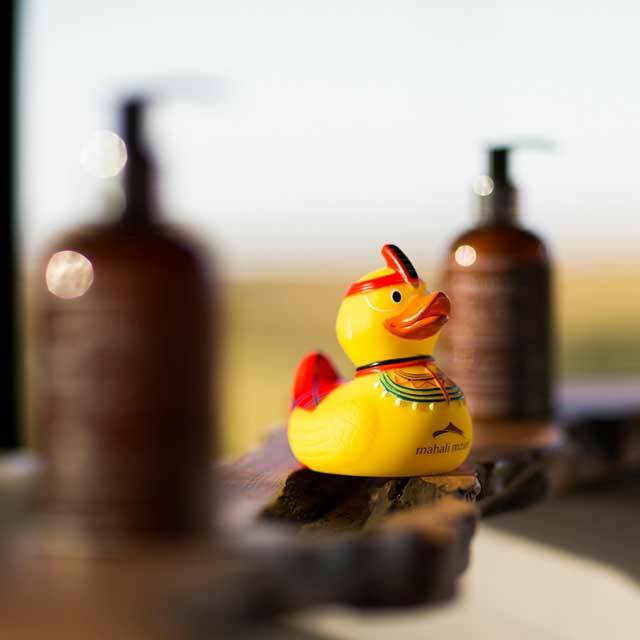 As a result of this attention to detail from the Mahali Mzuri staff, as well as the beautiful flora and fauna, Mahali Mzuri is "one of the best camps in Kenya" (trust us, take John's word for it). With over 8 years of guiding experience behind him, Jackson knows a thing or two about tracking Kenyan wildlife. Getting to witness wildebeest crossing the Mara River during the Great Migration is one of the most exciting parts of his job and who would disagree with that? While getting to see such beautiful African wildlife up-close every day is definitely one of the best parts of the job, Jackson says it is the teamwork and hospitality of all the staff that make Mahali Mzuri one of the best camps around!